From Paris you'll into slip your moorings and commence your wonderfully scenic cruise along the beautiful and majestic Seine into the heart of one of France's most historic and picturesque regions, Normandy. 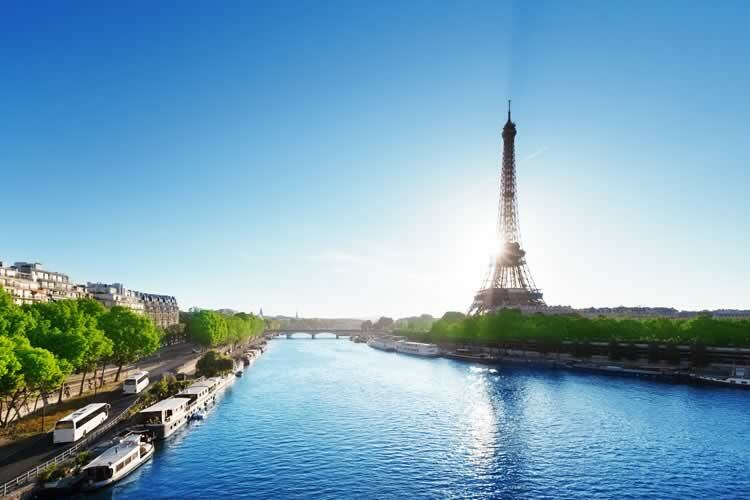 Take a late morning Eurostar from London, St Pancras International to Paris (connecting rail fares are available, see departures details) from where a coach will take you to the nearby ship, or you fly to Paris, Charles de Gaulle. Moored on the River Seine, the dedicated crew welcome you aboard your first-class floating hotel, ensuring you settle into you comfortable and extremely well equipped cabin and familiarise yourself with the ship. During the night the Swiss Sapphire has slipped her moorings and as you enjoy your first sumptuous breakfast, you rapidly get used to the fascinating sensation of enjoying the most luxurious floating sightseeing experience as the landscape passes serenely before you. Rounding a sweeping bend, so typical of the River Seine, at Mantes la Jolie a huge Cathedral dominates the left bank and then straight ahead is an imposing medieval stone bridge, destroyed during the Second World War, never repaired and the first poignant reminder this region of France has been a battleground for centuries. Beyond Mantes, again typical of the Seine, almost resembling giant’s teeth, the first of the picturesque chalk cliffs appear as the river meanders seawards. Stunningly beautiful villages like La Roche Guyon slide by, interspaced by verdant green countryside studded by countless cider orchards, half-timbered barns and contorted wooden farmhouses. We are truly in the heart of one of France’s historic and stunningly attractive dukedoms - Normandy. The lower Seine Valley is characterised by a huge series of sweeping meanders and as you cruise through the almost tortuous chalk cliff lined valley you’ll find it hard to work out if you’ve seen that hilltop before from another side – all part of the charm of a scenic river cruise. Whilst you are enjoying your first delicious lunch, the captain has skilfully berthed at Les Andelys, dominated by one of the most spectacular sights along the entire valley. The fascinating Chateau Gaillard, a huge medieval castle guarding the apex of this particular river bend was ironically built by Richard the Lionheart to defend Rouen from the French! A much appreciated feature of your holidays is that cruises are well-paced allowing time to really absorb your ephemeral surroundings, so this afternoon you are free to explore the historic little town of Les Andelys as you wish. 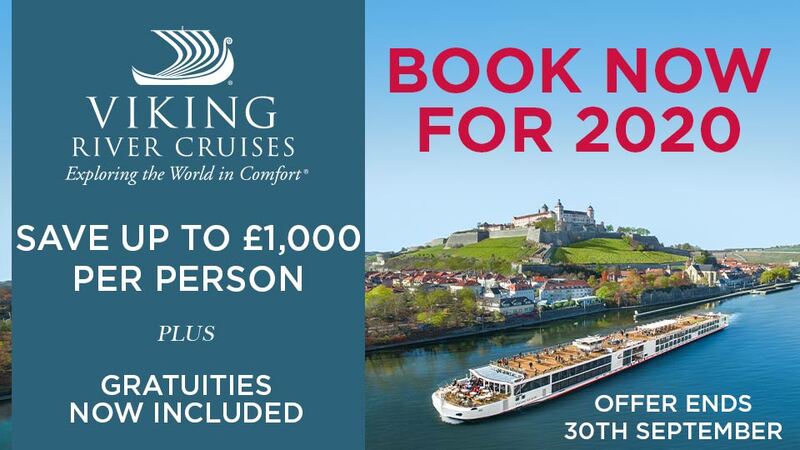 There’s also the opportunity to join the tour visiting Chateau Gaillard itself, learning about its tumultuous history and enjoy the stupendous views across the river’s bends and over the delightful Normandy countryside, probably the finest of the entire cruise. During your second lovely dinner you unobtrusively slip your moorings, and what could be better than heading for the lounge and a chance to discuss first impressions of the Seine with your fellow guests over a digestif! The evening cruise is delightful, past yet more bucolic scenery, some of the finest France can offer. Should you wish why not visit the wheelhouse, the Captain is always delighted to explain to those interested, how the highly sophisticated navigation and safety systems operate – boys and their toys! Awake in Rouen, Normandy’s historic capital, one of Europe’s finest medieval cities and scene of many momentous events over the centuries. Pride of place belongs to its stunning cathedral immortalised by Claude Monet over 30 times! An eclectic mix of architectural styles with its soaring spire briefly make it once Europe’s tallest building and is the final resting place of Richard the Lionheart and Rollo, William the Conqueror’s grandfather. Rouen’s beautiful tangle of medieval alleys are a revelation, wonderfully lined with antique shops, tasteful boutiques -as only the French know how, plus of course countless establishments offering culinary delicacies emphasising the country’s outstanding gastronomic heritage. In the Place Vieux Marche is one of the city’s most poignant spots; a simple garden of wild flowers marks where the legendary Joan of Arc was burned for her beliefs. Your tour sees all this and more. During another superb lunch you cast off navigating yet more amazing meandering bends through chalk cliffs bisecting steep forest-covered hills designated areas of outstanding natural beauty and the sanctuary of deer and wild boar. Another spectacular sight soon greets us, the magnificent 11th century Jumiège Abbey, one of the highlights of the entire valley and whose consecration was attended by William the Conqueror himself. It’s an amazing sight! Late afternoon, moor in the pretty village of Caudebec, so after dinner perhaps take a stroll exploring this lovely spot with its typical market square and richly decorated church adorned with stone carvings so fine they are more resplendent of a cathedral. After breakfast you’ll be ready for today’s full day tour to learn about two of the most important aspects of European history, the D-Day landings in 1944 and the Bayeux Tapestry. (Please note lunch is not provided today). Bayeux itself is a delightful town, thankfully spared the ravages of war, so you can marvel at the many splendid buildings including the grandiose cathedral in addition to the wonders of the tapestry itself. Telling the tale of William of Normandy’s expedition to invade England in 1066, this remarkable survivor which is actually embroidery rather than a true tapestry surely needs no further introduction and will bring back “fond” memories of many a school history lesson! The detail of embroidery is stunning and despite its age, the colours have hardly faded and it’s easy to agree this is the finest relic there is from the European Middle Ages. Mercifully peaceful today, this afternoon visit some of the many thought-provoking monuments and places, part of the remarkable story of the D-Day landings of June 6th 1944, and the tumult that once rent asunder the now peaceful Normandy coast. Visit Gold Beach where the remnants of the extraordinary Mulberry Harbour are visible and a timely reminder of the ingenuity that was critical to this extraordinary enterprise. After a day recalling such momentous events and the truly remarkable stories that surround them, thoughts turn again to the culinary delights awaiting you in the elegance and refined comfort of the Swiss Sapphire’s restaurant. Today take the drive to perhaps the most picturesque spot on the northern French coast – delightful Honfleur. Beautifully preserved, its old harbour, complete with both fishing boats and luxurious pleasure craft, is surrounded by a perfect waterfront of tall, pastel-coloured 18th century houses, many converted to seafood restaurants. Along the waterfront, watch the talented artists at work, capturing the delightful view for eternity whilst the intricate maze of streets behind are worthy of some exploration. The eaves of the tall, half-timbered buildings almost touch and on the streets below is an abundance of traditional shops selling all sorts of items such as antiques, books and fine foods. The locals stop, exchange a few words, kiss on both cheeks and continue on their way – archetypal provincial France. Honfleur’s most famous son is Eugene Boudin, the forerunner of Impressionism whose most famous pupil was a certain Claude Monet who painted here many times. Returning for lunch, the ship retraces the river’s enchanting scenery, its meanders, ever-changing wildlife, country estates and forests all reflecting differing colours in the sparkling waters as the Swiss Sapphire cruises upstream. Villages slip by, birds glide on numerous thermals soaring from the surrounding cliffs and it’s an ideal opportunity to join new friends for a chat as this ever-changing kaleidoscope slips by. Squeeze in a spot of reading on the Sun Deck or simply recline, let the gentle breezes so characteristic of the stately progress of a luxury river cruise vessel lull you into a relaxing doze. By this stage of your cruise you will be totally unwound and modern life will seem very distant. 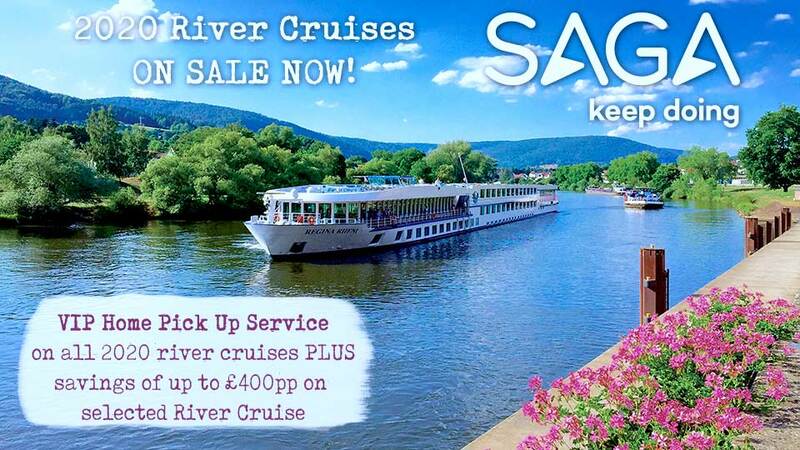 A great delight of river cruising is the magical sensation of waking up in a different place to where you retired. Awaking this morning, the ship has moored in delightful Vernon, taking the short drive to Giverny visiting one of the world’s most famous, probably it’s most photographed and almost certainly its most painted garden and the home of the great Impressionist artist Claude Monet, and it’s ideally viewed in the delicate morning light. This is where the famous ‘Nympheas’ or ‘Water Lilies’ were painted. You can also see the renowned Japanese bridge too, still there after all these years with the flower garden preserved exactly how it was nearly a century ago. Absorb the tranquil atmosphere and wander entranced, as each image from that legendary portfolio of impressionism comes into frame, marvel at the light bouncing off the foliage of every hue and wonder at the dynamism in the reflections dancing off the water just as the great master himself once did. After another leisurely lunch you can explore sleepy Vernon’s quintessentially half-timbered Norman streets before your cruise to Paris. As the sun sets on the shimmering Seine and the Norman countryside recedes into dusk, it’s a perfect time to reflect on your few days cruising amongst the creamy chalk cliffs and villages of this splendidly tortuous river, perhaps take in the cool of the evening air enjoying the unrivalled beauty of twinkling riverside lights reflected along the water’s edge. Arrive in Paris and this morning take a sightseeing tour of probably the world’s most iconic city. Notre Dame, the Arc de Triomphe, Champs Élysées, Sacré-Coeur, the Eiffel Tower you see these and much, much more. The grandiose Place de la Concorde, largest square in the city, shows off 18th Century French architecture at its best and just over on the left bank you’ll find the Musée d’Orsay, home of the world’s finest Impressionist art collection. The world famous Mona Lisa and the Venus de Milo, plus countless other stunning exhibits grace the Louvre. There is the eccentric and yet stylish Pompidou Centre famous for modern art and street entertainment. The Ile de la Cité is dominated by Notre Dame and the delicate spire of the sublime Ste. Chapelle. The variety is arguably unmatched. After lunch you could visit fine shops such as the Galeries Lafayette and the smart arcaded Rue de Rivoli or perhaps just wander round bohemian Montmartre. Paris is everything you imagine it to be, romantic, inspiring, vibrant even outrageous, but best of all Paris is unique and a fitting finale to a wonderful cruise. This evening is the Captain’s Dinner, hosted of course by the Captain himself, a delightful experience featuring specialities of the regions through which you have travelled but probably tinged too with a little sadness in the knowledge that it is the last evening of your wonderful adventure. This morning, at the appropriate time you will be transferred to either the station your return Eurostar journey to London. Fares displayed are based on return Eurostar from London St Pancras. Return scheduled flights from a selection of regional airports are also available but may carry a supplement. Guided tours in Paris & Rouen plus visits to Caudebec, Les Andelys & Vernon and excursions to Claude Monet's house, Honfluer, the D-Day Normandy Beaches and the world famous Bayuex Tapestry.